I am BonnieT6, hire me today! The T6 is very economical, up to 50mpg, and very easy to drive, so all you have to do is turn up and enjoy! New/reconditioned original 1600cc engine put in November 2018. 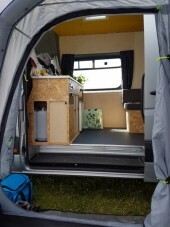 Marigold is T2 VW for hire from Edinburgh! Cuillin is a 2009 T5 Transporter, professionally converted 2 years ago. There is no hook up so he is ideal for wild camping around Scotland with a leisure battery and diesel heater. Based in Midlothian on the outskirts of Edinburgh.